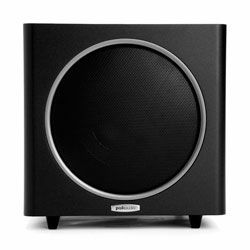 The Polk Audio PSW110 is an amazing 10-inch model which can provide you with clear and rich bass sound. This solution would be a perfect option if you are going to use it in a small or a middle-sized room. The construction of this model allows limiting the audio distortion at high volume levels. This model was designed using the Klippel authentic measurement technology to improve linearity, deepness, and precision of the output sound. 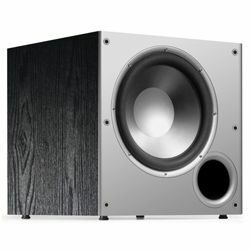 The Polk Audio PSW110 review will be extremely helpful for people who look for a great solution used in a small or in a middle-sized room. This model features a 10-inch round dynamic balance composite cone with a vented downward firing port. This model is flexible when it comes to the input ports since it has RCA LFE inputs and RCA stereo line level inputs. It also has 2 speaker outputs and inputs. The body is a heavy-duty MDF and it was engineered to achieve perfect volume and avoid any distortion at low frequencies. This model is internally braced and damped to eliminate internal standing waves and resonance, while the directed port produces the maximum bass impact. The patented Dynamic Balance technology is used to design the internal parts and ports layout to provide you with clean audio output. The driver materials are durable and stiff. The dimensions are 14x14x17 in and the weight is 33.5 pounds. 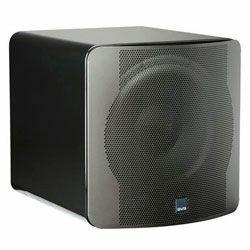 The PSW110 specs prove it to be a good option for small and middle-sized rooms. The nominal output power of this model is 100 W, while the maximal output power reaches 200 W and the audio amplifier output power is 200 W. The speaker inputs (spring terminals) are gold-plated so you will get no noise. The sensitivity of this model is 85 dB, while the frequency response is from 32 Hz to 250 Hz. The crossover frequency ranges from 60 Hz to 160 Hz. This model also features a low-pass filter and a phase switch. It also features a smart sensing circuitry technology that allows turning this device on and off automatically. The compression circuitry technology limits the output audio distortion at extremely high volume levels. Customers are satisfied with the bass sound this model outputs. The output is clear, especially when it is used with a good receiver, DTS and HDMI connectors. This model handles the very low ranges extremely well. 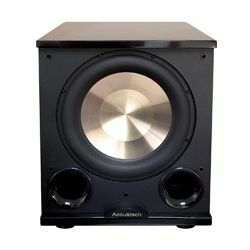 However, many customers agree that this model is a good option only if you do not have much space with bass sound. Some customers also claim that this model is a great option for pop, jazz, and classical music. It can be quite loud as well, so you may not want to set the volume too high. Nevertheless, some customers claim that this model is not very reliable (can be true for certain units) and their subwoofers worked for about 3 years and then the amplifier board fails. The PSW110 setup process is straightforward. This model comes with a very detailed user guide. The back panel has all the necessary ports and everything is labeled, so you will not make a mistake. There are also deals for you to tweak and you just need to play with them to find the Polk Audio PSW110 settings that will work for you. Usually, customers have no problems with it and it does not take too much time. This is a great high-performance model which is able to provide you with amazing sound. This solution may be a great option for your room. The Polk Company used various technologies to make sure the output sound does not get distorted. It is easy to use – you just hook everything up and tweak various adjustments to make it sound as you want. Many customers also state that it gets even better if you use it with a high-performance receiver. This model will be a perfect option for people who need clear bass sound for movies and music.